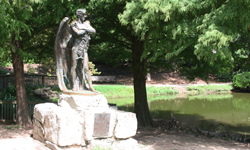 Standing in a tranquil part of Sam Houston Park, the Spirit of the Confederacy is a bronze statue representing an angel with a sword and a palm branch. 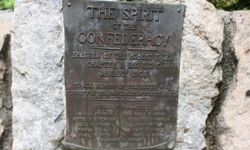 It was erected in the park by the Robert E. Lee Chapter #186 of the United Daughters of the Confederacy in January 1908. Its dedication states “To all heroes of the South who fought for the Principles of States Rights.” The statue stands on a pedestal of rough-hewn granite. The sculptor, Louis Amateis, was a native of Italy. After studying at the Institute of Technology and the Royal Academy of Fine Arts in Turin, and after launching an award-winning art career there, he immigrated to the United States, living first in New York City, and then in Washington, D.C. He had a distinguished academic career and produced many works of nationally significant monumental art, including four in Galveston, and, in stark contrast to the somber dignity of Spirit of the Confederacy, a statue of a tiny elf named Brownie, which makes its home in the Houston Zoo. Amateis died in Washington, D.C. in 1913.